The Union Ministry of Environment and Forests has agreed to allow independent agencies to evaluate how well it is managing forests. In keeping with the forest certification mechanisms followed by various countries, the ministry has finalised a scheme that will allow certification of forest produces like timber, minor forest produce, medicinal or aromatic plants and products made from them as “harvested from responsibly managed forests”. Officials say the move will ensure domestic forest produce command better price in the global market, while encouraging sustainable harvesting of forests in the country. As per the scheme, an independent Indian Forest Certification Council, comprising independent experts from forestry, economics and social fields, representatives of non-profits and forest officials, will be formed to govern the certification process. An independent body associated with the council will accredit certifying agencies, which will evaluate the management of forests against internationally accepted criteria of sustainability, and certify the produce harvested from such forests. The scheme is waiting for the nod of the environment minister. It will then be sent for Cabinet approval. The council is expected to be in place by March-April this year. Forest certification emerged as a market-based response to avoid rapid deforestation in Europe and America in the 1990s. Since then, most forests in the continents have been certified. However, India had shied away from allowing independent scrutiny of its forests. Though the ministry had started deliberating the certification mechanism in 2005, it took another five years for it to conceptualise the mechanism and prepare policy guidelines. Sources in the ministry say the delay could be due to the resistance from a section of forest officials who thought the department had been successfully managing the forests for over 150 years and there was no need of certification. A few were apprehensive that the country’s forests may not meet the high global standards and invite unnecessary criticism. But the growing emphasis by the European and American countries to allow only the certified forest produce in their markets in the recent past forced the ministry to shed its inhibitions. In 2009, the US amended its conservation law, requiring importers of wood and wood produce to certify that the imported timber was legally harvested in the country of origin. A similar legislation will be introduced in the EU next year. 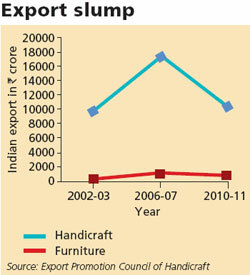 Both the US and the EU are major markets for Indian woodcraft and furniture. The impact of their policies are showing up as non-certified products from India are not fetching good price in the international market (see graph). “If we do not secure certificates for our forests, the forest-based industries will suffer big time loss in exports in future,” says an official with the ministry. To thrive in the global market, many forest produce-based industries are importing raw material from certified forests in other countries lately. 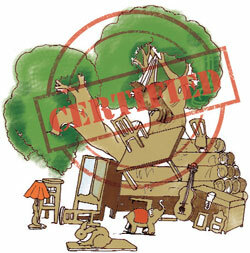 Private plantations are acquiring certificates from international certification agencies. Since there is no competition, certification process is expensive. Once India has its own validators, certification price will come down substantially, the official adds. Welcoming the move of the government, T R Manoharan, head of forest programme of WWF-India, who also represents Forestry Stewardship Council, one of the leading global forest certification authorities, however, says to ensure credibility of the Indian certification scheme, it is crucial that the government only acts as a facilitator for the certification and the mechanism remains independent with provisions of balanced stakeholder engagement. Its good to see a strong move being established to safeguard the Forests, but then it still leaves us with questions,like, where plethora of environmental clearances are doctored for a faster process of implementation, how far can this new body or rather certification process help??? Forget how far? Will it really help? Environmental clearances have become fiascos of the ministry today. Setting up another body, simply means, legitimately making money out of it. Certification processes like these, especially on the forest management issues are great to be conceptualised, but then when it comes to operations,the entire loyalty issue goes for a toss. More the number of monitoring bodies, means more levels of corruption. These procedures, unless monitored for their transparencies, cannot be considered to be WORTH a DEAL...!! !